The constellation Hydrus. Roll mouse over to see labels. Hydrus is a small constellation close to the south celestial pole. At most southern latitudes it is circumpolar, but appears highest in the midnight sky in October. Easily confused with Hydra, the mythological water snake, Hydrus is a smaller water snake introduced by Pieter Dirkszoon Keyser and Frederick de Houtman, which first appeared on star maps in 1598. It is one of twelve constellations they introduced in that year which celebrate rare or exotic animals. 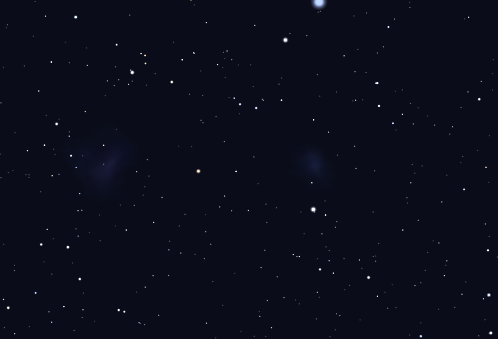 Hydrus is represented by three third-magnitude stars and two fourth-magnitude stars in a line which snakes between the Large and Small Magallanic Clouds (LMC and SMC). It does not have any bright deep sky objects. 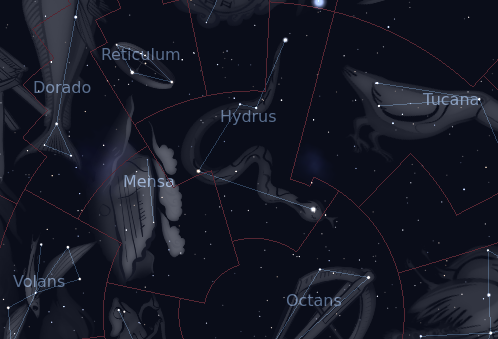 The following constellations neighbor Hydrus: Dorado, Eridanus, Horologium, Mensa, Octans, Phoenix, Reticulum, Tucana.